Is Cumaru the New Ipe? 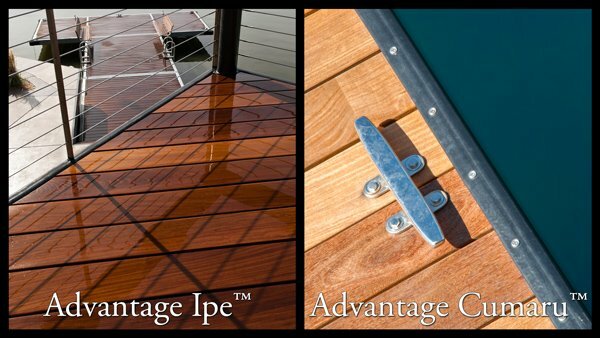 Advantage Ipe™ & Advantage Cumaru™ are two gorgeous hardwood options. Cumaru isn’t exactly the new kid on the block in the exotic decking neighborhood, but it has recently become the choice of wood for many designers, architects, and contractors. Its versatility, color, and similarity to Ipe has allowed Cumaru to be used for residential and commercial applications. Cumaru is very comparable to Ipe, differing by the narrowest of margins. In the arenas of hardness, strength and density, Ipe still reigns as king, but Cumaru comes in at an extremely close second. Cumaru, just like Ipe, is rot, termite, and mold-resistant, and they both have a remarkable lifespan of 50+ years. The biggest distinctions the woods carry are their color and price. Cumaru is a wood that has a very wide spectrum of color. Some boards come in maroon color while others are fairly blonde with hints of brown. Some people love the color variations Cumaru offers because it adds a unique characteristic only natural wood has. When it comes to price, Cumaru can be obtain at an average of 20-30% less than Ipe. Choosing between Ipe and Cumaru isn’t a hard decision to make. Both have legendary reputations and both will practically last forever. The differences aren’t that drastic, the only deciding factors are: what color suits you best and if price is important. This entry was posted in Cumaru Decking, Ipe Wood on January 5, 2014 by Mr. Ipe Hardwood.